Last week Goodwill opened a new thrift store just a few blocks from where I work! Although there are several Salvation Army thrift stores around town this is the first Goodwill. I’ve had great experiences at their stores in the lower 48, so I was pretty excited to see what it was like here. I’m happy to say that they met my expectations and exceeded a few too! The first thing they did right is choosing a good location. Not only is it near my work (extra points for that!) the building is massive and has great parking. It was previously a sports equipment store so the interior is newer and wide open. They even have enough space to use half of the store as the donation center, which includes a cover you can drive under so you don’t have to deal with Alaskan weather just to drop off items. I came on opening day, but waiting until lunch time figuring the 8 am grand opening would draw the biggest crowds. Unfortunately I forgot to factor in that it was spring break that week so everyone was looking for things to do and this was apparently one that many chose because the place was super busy! Several times I skipped aisles because they were too congested to get a good look at the items on the shelves, but I’m sure that was just because of this was opening day. I skipped the clothes, shoes and books this visit and instead made a beeline for housewares where I searched for project materials and décor items. It was well stocked and the staff were constantly bringing out more items to keep the shelves full. They also did a great job with creating their employee team because every staff person I encountered as friendly and had wonderful attitudes even as they tried to squeeze around shoppers to do their job. One gal was cleaning up some broken glass from a dropped item and could barely find room to sweep but it never phased her. In fact she made it an opportunity to spread cheer and noted that shopper safety was her priority. Another thing they did right were the prices. That’s a big thing here in Alaska, where several of the thrift stores seem to think they can charge a few pennies less than retail on items. It also didn’t hurt that I had a 20% off coupon thanks to donating before the store opened! 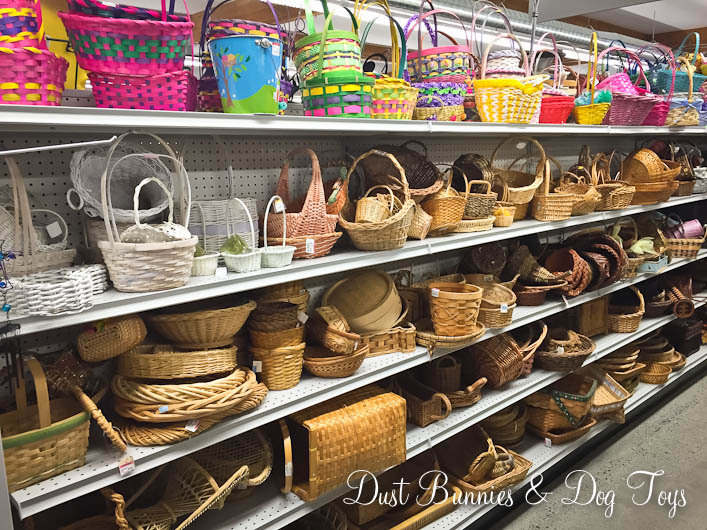 🙂 I ended up finding so many treasures that I had to switch from a small roll behind basket to an actual shopping cart which was mounded over by the time I made it to the cashier line. Check out was another spot they exceeded my expectations. They had someone monitoring the line to make sure no one snuck past and went straight to the cashiers, plus they had tech support standing by for any little glitches the new computer systems might have. And all of the staff on the cashier line were smiling and helping each other out when there were questions. 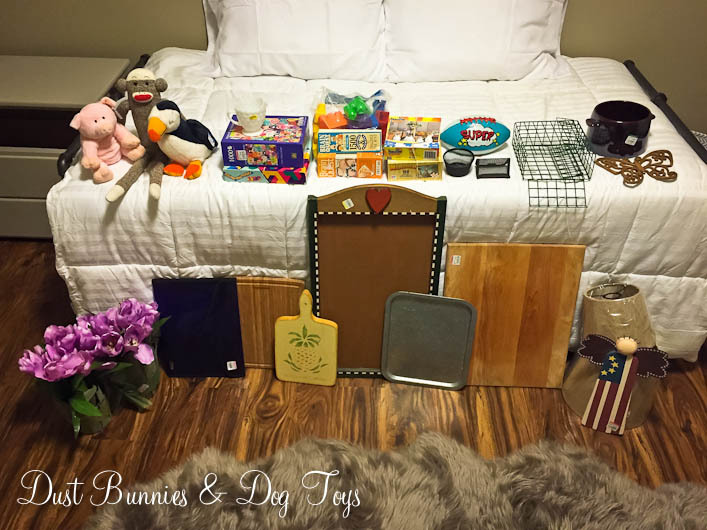 With my coupon I ended up spending just over $60 for this haul, which included puzzles, games and stuffed animals for the foster room plus Easter décor, yard art, dog toys, a treat holder for the chickens and several pieces that will become sale projects. Hopefully this location will continue to impress with good selection, affordable prices and great staff. If they do, I plan to be a regular! 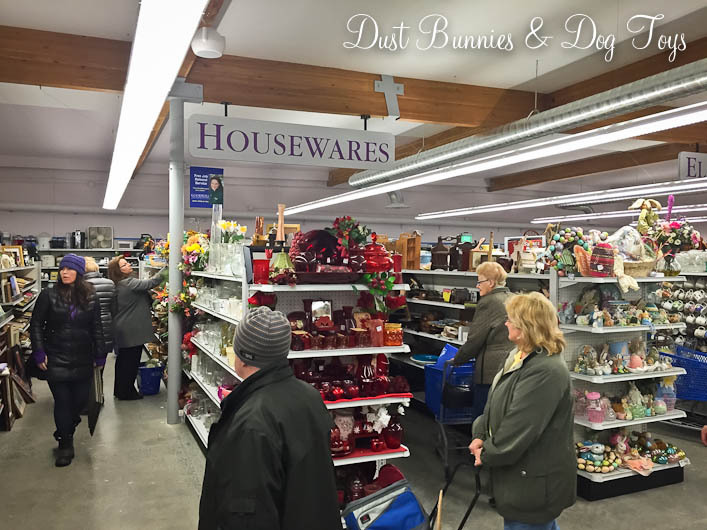 What great treasures have you found at thrift stores recently? Leave me a comment to share!